For the Canadian comedian, see Brian Froud (actor). Brian Froud (born 1947) is an English fantasy illustrator. He lives and works in Devon with his wife, Wendy Froud, who is also a fantasy artist. The landscapes in his paintings are frequently inspired by Dartmoor. Froud at the 2012 New York Comic Con. Illustration, painting, writing, and conceptual design. Froud was the conceptual designer and costume designer for the films The Dark Crystal and Labyrinth (both in conjunction with Jim Henson's Creature Shop). 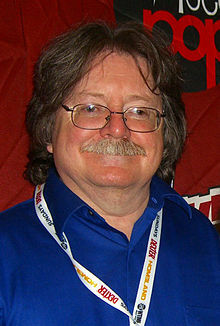 He collaborated with Terry Jones, who was a screenwriter on Labyrinth, on The Goblins of the Labyrinth (1986, re-issued in abridged form as The Goblin Companion: A Field Guide to Goblins in 1996), and subsequently on a number of non-Labyrinth-related books about fairies and goblins, namely of the "Lady Cottington" series, such as Lady Cottington's Pressed Fairy Book. He has also worked with American writer Ari Berk on more recent books, including Goblins! and The Runes of Elfland, and produced art books such as Good Faeries/Bad Faeries. One of his most famous art books, Faeries, produced in collaboration with Alan Lee, was the basis of a 1981 animated feature of the same name. Froud's son Toby portrayed the infant of the same name in Labyrinth; he is now an accomplished puppeteer and creature fabricator. ^ "1995 Hugo Awards". World Science Fiction Society. Archived from the original on 2011-05-07. Retrieved 2010-04-19. ^ "1999 Hugo Awards". Locus Magazine. Archived from the original on 2014-04-06. Retrieved 2014-03-14. ^ "The World of Brian Froud". Archived from the original on 2011-02-21. ^ "Faeries". Internet Movie Database. ^ Brian Froud; Alan Lee (1979). David Larkin (ed.). Faeries. Bantam Doubleday Dell Publishing Group. Wikimedia Commons has media related to Brian Froud.